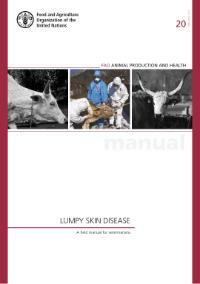 Lumpy skin disease is a vector-borne pox disease of domestic cattle and Asian water buffalo and is characterized by the appearance of skin nodules. Endemic across Africa and the Middle East, the disease has, since 2015, spread into the Balkans, the Caucasus and the southern Russian Federation. Outbreaks of LSD cause substantial economic losses in affected countries, but while all stakeholders in the cattle industry suffer income losses, poor, small-scale, and backyard farmers are hit hardest. The disease impacts heavily on cattle production, milk yields, and animal body condition. It causes damage to hides, abortion, and infertility. Total or partial stamping-out costs add to direct losses. Indirect losses stem from restrictions on cattle movements and trade. In addition to vectors, the transmission may occur through consumption of contaminated feed or water, direct contact, natural mating or artificial insemination. Large-scale vaccination is the most effective way of limiting the spread of the disease. Effective vaccines against LSD exist and the sooner they are used the less severe the economic impact of an outbreak is likely to be. This resource was created with the assistance of FAO (TCP/RER/3605)) in order to inform specialists, owners of bovine animals, livestock farmers with different levels of biosecurity, farmers, hunters, butchers, carriers and ordinary citizens about the state and degree of threat of LSD, peculiarities of recognition of the disease, specificity of its prevention and elimination in case of the emergence and familiarization of specialists with advanced experience in the organization of anti-epizootic measures. It includes components of GIS, which will provide comfortable data entry into the system in case of outbreaks, followed by their visualization, and involves the active collaboration of veterinary doctors with animal owners and objects under control. We hope that this resource will become a reliable source of up-to-date information for interested citizens and improve the awareness of society as a whole. Assistance to the countries of the region at the global and regional levels. European Animal Disease Notification System "ADNS"
Copyright © 2015, SICVM «Veterinary space». All rights reserved. Online DL Course - Stop the LSD !